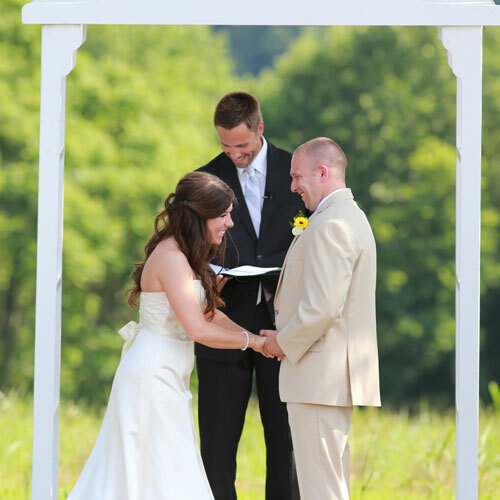 It was lucky for Adam and Brittany that the two had a matchmaking friend to set them up. After a blind date at a group function, the pair hit it off immediately and fell in love soon after. It was during a night in september when the couple went together to dinner with their friends, and as they were walking across the lawn to their home, Adam got down on one knee and proposed. Brittany admits, though, that she was so exhausted and surprised, she almost didn’t let him finish his speech. But, she was thrilled to accept the love of her life. Since Brittany is such a bargain hunter, the wedding was done on a miraculous budget. In order to save money of the cake, they used a small display cake and served their guests large sheet cakes. Then, all of the sheets and decorations that weren’t kept after the wedding were resold! The color for the decorations was tiffany blue and offset against bouquets of sunflowers and served food from Three Little Pigs BBQ, which their guests loved. The wedding day was full of many memorable moments, but one that stands out to Brittany is walking down the aisle toward Adam. As her dad guided her to him, she looked at his smiling face and couldn’t contain how excited she was to start her future with him. When she finally got to the altar, Adam leaned into her and told her how beautiful she looked. It was such an intimate moment for the couple and they were overjoyed to share it with all of their loved ones. The day continued without a hitch and the two were able to be sent off with well wishes from their guests. Make sure to see more of the Looney Wedding on page 60 of bridebook!